NEW YORK, NY – LaterPay – a technology company offering an industry-first, patented payment infrastructure designed to offer users immediate, frictionless access to content or services without requiring upfront registration or payment – has partnered with enterprise digital experience platform WordPress.com VIP to help publishers and digital media companies monetize content and services on their WordPress-powered websites. WordPress.com VIP – which handles hosting, guidance, and support for major publishers including Time Inc., News Corp, and PMC – will offer LaterPay as a technical integration, making it available to clients on its platform as a plugin. LaterPay saves users time and increases conversions for publishers. Instead of requiring upfront registration and payment – which derails over 98 percent of all intended purchases – LaterPay defers this process until customer purchases across websites reach a $5 threshold. By using LaterPay, VIP-hosted publishers can simultaneously expand existing subscription models, increase their paying customer base, and improve their user experience. 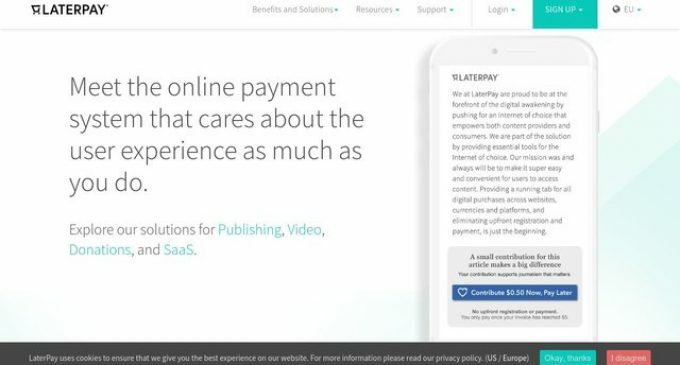 LaterPay turns users into paying customers for digital content or services such as journalism, videos, and software. LaterPay owns patented technology for enabling payments and micropayments without upfront registration and payment, facilitating the “use now, pay later” approach. This allows users to consume paid content and services on the internet with one or two clicks — without prior registration or having to pay in advance. It is only when the online tab’s limit is reached that users are prompted to register and pay via one of many popular payment methods. By decoupling purchases from payments, LaterPay lowers the entry thresholds for users to consume digital goods and services. With LaterPay, companies can tap into new customer groups, get users acquainted with paid content, and gradually but successfully market higher-value paid models such as time passes and subscriptions. In this manner, LaterPay builds a bridge between free, ad-financed offerings and subscription models by providing a paygate. LaterPay aims to empower content providers to monetize the vast space that lives between ads and subscriptions. WordPress.com VIP offers a fast, scalable and secure managed cloud platform, expert code review, and end-to-end guidance on running content applications at scale. VIP provide hosting and support for some of the biggest brands on the web, including News Corp, Time, Inc, and Facebook. VIP’s partner network offers the best WordPress design and development shops on the planet along with top notch technical integrations. These technical partners are services with which we have developed tight integrations and close business relationships. They have been carefully vetted for performance, security, ease of use, and scale, and are certified and supported by our team.